This week’s discussion here at The Legal Genealogist of law books and legal dictionaries morphed into noting what’s written inside the covers of books. And, of course, what that writing tells us about our families. Now… The Legal Genealogist surely doesn’t have a treasure like the one colleague Gordon Remington found — a Revolutionary-era family record set out in the covers of an early law book owned by his lawyer grandfather and great-grandfather.1 There’s nothing in my possession, or even the possession of my extended family that I know of, that goes back much beyond my own generation. But even when it’s just our own generation, or our parents’ generation, noting the inscriptions is important — because we are the historians of the future. Someone in a future generation, for example, is going to want to know what was going on in the covers of a set of World Book Encyclopedias owned by my family. Of course, anybody who grew up in the 1950s and 1960s is going to know these encyclopedias. Just about every family owned a set — door-to-door salesmen came around and convinced middle-American parents that their children had to have them to succeed. And so we did. Over and over and over. To the point where I’m surprised the covers stayed on and the print didn’t wear off. And, somehow, those books survived years of use and moves and storage to surface after my mother’s death in 1999. At which point the question became, what do we do with these books? It would have been easy to simply chuck the whole set. We’re talking seriously outdated reference materials here. But my two youngest brothers came up with a different idea. Warren took half of the books and Bill took the other half. And each time they get together, one volume from Warren’s set gets swapped for one volume of Bill’s set. And inside the covers they write a note. Most of the time it’s funny. Sometimes it’s poignant. It’s always wonderful. These are already a treasure. And any genealogist can only imagine how cherished these volumes will be in a generation or two. So even in our own generations, in our own lifetimes, we need to note the inscriptions in those books. Sometimes — as in the case of these World Books — the physical volumes will survive to be passed on. And sometimes it will just be the memories of what was written that can be noted and handed down through the years. Like my own memory of finding a volume in my parents’ attic while helping them prepare for a move to Texas in the early 1970s. My father’s job was taking them away from the house where we’d lived for years in New Jersey and the first major weeding of accumulated stuff had to occur. I was going through some boxes of books to see what was and what wasn’t worth keeping. That’s when I came across it. A little volume with a title along the lines of The Rhythm Method. Written by somebody with the letters S.J. after his name. Now I wish I’d had the forethought to snag this little gem at the time, but I didn’t. I did, however, carefully study — and consider the implications of — the book. The first thing you have to remember is that my parents had a lot of kids. I have six full siblings and one half-sibling. The second thing you have to remember is that they weren’t Catholic. That by itself is funny enough. But it’s what was written on the inside front cover that was priceless. Yep. Proof positive of the failure of the rhythm method… and a birth record of my older sister. Even better… considering that the record is proof positive of the failure of the rhythm method? No wonder I have a ton of siblings. And a story I can pass on to the youngsters of the family. What’s your family’s story, recorded on the inside covers of a book? What a great post. Thank you, Judy! 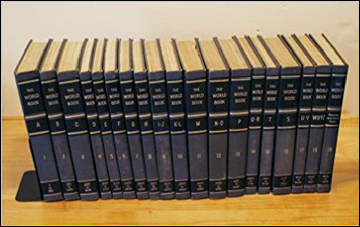 I have the complete set of my family’s 1958 Encyclopedia Britannica, which I rescued from the “dispose” pile of my mother’s possessions when she passed away. I also have a treasured photograph taken shortly after we got the set. It’s of my older sister and me sitting on the sofa in our pajamas, totally engrossed in one of its volumes. No one has written anything inside any of the covers of the volumes yet, but now I’m going to start … by pasting in a copy of that photo! My husband and I each have a few books owned by parents and older relatives. No wonderful genealogical treasures are inside, but we do have their signatures. I did smile when you mentioned “seriously outdated reference materials”, though. I insisted that my parents not throw out our childhood set of encyclopedias because the article on Horse Racing is illustrated with photos of the match race between Seabiscuit and War Admiral. So long, Charlie! Great find in those photos, for sure. A little family humor there Judy that will be PRICELESS to the family for generations to come! Thanks for sharing. Thanks for the kind words, Stan! Yours, and the comments, are all funny. Mine isn’t, but it’s precious to the family all the same. I have a Bible that belonged to my gg grandfather. I suspect family Bibles are the most common family books, so what’s the big deal? This one had multiple blank pages before and after the printing. He used that space to write tiny but clearly legible commentary on the book of Revelation, some of it in red ink (they weren’t words of Jesus, either), some in Greek, Hebrew, and Latin. He used every bit of space. Years later, I found in the Library of Congress that he’d written a book. Yup, it was on the book of Revelations. I was able to get a copy of that book. It was wonderful to have the notes in the Bible and what he wrote from it 15 years later. That’s a spectacular find, Doris! Totally fabulous post, and your family will certainly have a treasure with those encyclopedias. My mum’s family were hoarders, and were known to write and keep everything in books, so it’s a common thing for me to simply page through any old book my parents have inherited and find stuff. One was my great grandpa’s driver’s licence. But the inscriptions insde are precious too, like the bible that my 2x great grandpa gave to his wife on their wedding day. Our set was red. We looked everything up in those well worn encyclopedias. I wonder where they have gotten to. Somewhere in my parent’s home I am sure.